Since Florida’s repeat in 2007, no defending champion has gotten past the Sweet 16. Last year, North Carolina lost in the 2nd round, despite being a No. 2 seed. The year before that, Villanova was the No. 1 overall seed and couldn’t get past the 2nd round. Both Michigan and Tennessee are 6-4 in its last 10 games. Since 2008 (excluding First Four), there have been 38 tournament games between teams that already played each other that season. Winners of the first matchups are 24-11 (.686) in rematch. 24-11 does not add up to 38. I questioned them a couple hours ago and just like every other sports account posting info, they ignore the question when caught sharing faulty info. "We just got hit at +300 by pretty much every sharp account on our books. Had to move to +250. Massive Duke liability opened up in a matter of minutes." In 35 instances, the winners of the first matchups are 24-11 (.686) in the rematch. 18 of the past 22 first-round games involving CAA teams have ended in victory or a single-digit loss (14 by five points or less). Since 2012, there have been 5 4-seeds favored by 6 points or fewer over a 13-seed. Those 5 went 1-4 ATS and lost 3 outright, including Bruce Weber's 2013 K-State team, which lost to La Salle as a 6-point favorite. In last 10 years, there have been 6 AQs from P5 confs that were dbl-digt seeds. Those 6 went 5-1 in R64, incl Oregon which reached the Sweet 16 as a 12-seed in 2013. Interestingly, 4 of the 6 were Pac-12 AQs. All 4 won their R64 game. Washington also reached the Sweet 16 in 2010. In 23 NCAA trips, Rick Barnes has made it past the Sweet 16 3 times – 2003, 2006, 2008 – but those are the only 3 times Barnes’ teams have previously been a top two seed. 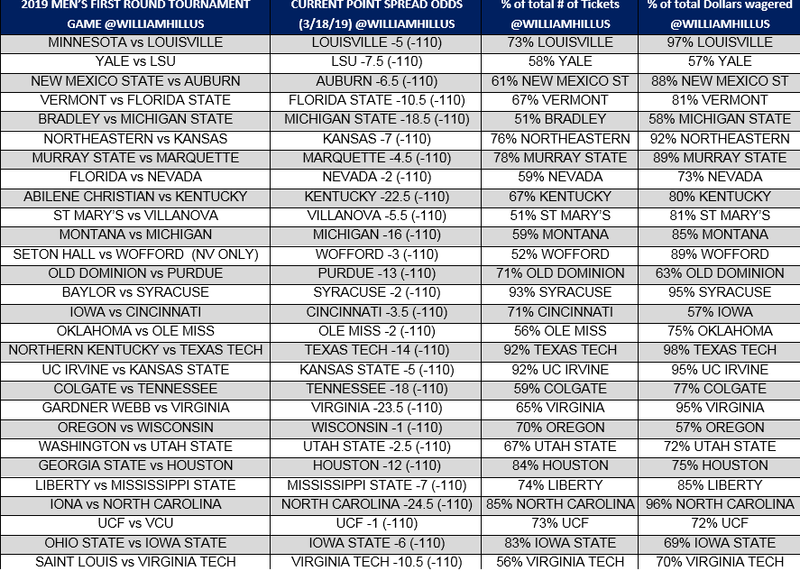 Barnes teams are 1-7-1 ATS in their last 9 NCAA tourney games. This is the first time since 2013 Villanova is lower than a 5-seed. Under Jay Wright, the Cats have been lower than a 5-seed four previous times. Villanova lost in the first round three of those four times. New Mexico State always seem to be a trendy first round upset pick, but that hasn’t worked out too well lately. Since moving to the WAC, New Mexico State is 0-8 in its first round game, losing by 12.5 PPG and going just 2-6 ATS, each coming as an underdog. John Calipari’s teams are 3-8 ATS (11-0 SU) in the 1st Round as a 1 or 2 seed. At least one No. 11 seed has reached the Sweet 16 in each of the past five tournaments. 11 seeds have won 8 of 12 games vs six seeds the last three years. "As of today, we have liability on just one team to win-it-all. That team is Virginia, currently +550"
LSU opened -8 at The SuperBook, but Yale money knocked the number down a tick to 7.5 for a 12:40 p.m. ET Thursday contest. FanDuel has taken a $25,000 bet on Virginia to win the Tournament ... Will pay $212,000 if they win. On first look, I really like Cincy -1.5. That line smells like absolute poopoo. Why is Cincy barely favored? Iowa is probably a top 10 cold team right now. Classic 12-5 matchup, great ATS run, etc. I believe all the 12s got destroyed last year if I’m not mistaken. I might be wrong but I was thinking last year was 0-4.